Where to outsource my business? This would be the most basic question that will come up once you are planning to have your services or products be facilitated by an outsourcing company. That will play as the front liner of your business to perform such task required. Virtual & Telemarketing LTD has been established to help out those businesses that are facing such troubles with productivity, quality and services. We can tabulate such equations and formulations that give solutions to your problems. Talk to us today and we will be happier to give answer to your marketing needs. We can offer you a very economical rate with guaranteed high quality of service. We are not just dealing plainly for typical business sake but we are more interested in seeing once business growing by our own means of creativity and commitment. For your fulfillment and satisfaction with our services offered is what we called “Our Success!” Virtual & Telemarketing LTD is a group of Customers Service Representatives who has been working for years with the BPO industry offering the highest quality standards of Customer Service, Sales, Lead Generations, Surveys, and Appointment Settings and Any Virtual Related Jobs. We use to maintain a symbiotic relationship to all our clients. So we simply set our perspective of making all things rational for both sides. We want that our clients would be happier by increasing their Return of Investment or (ROI) by providing not just a good numbers but a high rate of sales & service conversions. On our end also, we mainly promote a healthy working environment for both management & staff and encouraged every team member to be more consistent, efficient, tactful, open, and effective. To be more aggressive in learning more, to always have a timely initiative in every circumstance that they may heap into a certain shift, also in attaining a better Key Performance Indicator (KPI). To initiate further trainings and enhancement programs that could make Virtual & Telemarketing LTD. Not just contact center provider but the most clients preferred agency. MISSION & VISION: Our mission is to rise above the competition to give the most affordable and the most flexible online communication service in the country through method and technology optimization. We also continually update our services and methods to meet your online marketing demands. So if you have any ideas to bring in more clients closer together, call us and we’ll do our best to put all your ideas together for you. "VIRTUAL & TELEMARKETING LTD has gathered some of the best online specialists in the country, where we offer the most extensive list of online services. We also offer the most flexible service packages that would fit anyone and everyone’s need for online customer communication." Were finding ways to serve you even more better so please feel free to talk to us at anytime. Why Hire Virtual Assistant From Offshore Staff Pty. Ltd. Looking for a Virtual Assistant? Talk to us today! Then we will be giving you the best. We can provide your Virtual Assistants Needs- ASAP! Offshore Staff have Fully Trained and Professional Virtual Employees. Before becoming an Offshore Staff member, all our call centre agents are required to successfully complete a rigorous induction, to ensure all agents demonstrate exemplary professionalism and language skills. Combine this with No Set Up Fees (some conditions do apply), Fixed prices, Great Service and Fast Set up and you can understand why our services will prove invaluable to the growth of your business. Are you having any conflicts in Marketing your products, coding a website, integrating online shopping carts, email management campaigns, updating social media accounts, or running through different appointments? Doing stuff all by yourself could make you a damn. Why do things solo when you can make things easier that you should be? Hiring a dependable virtual assistant or VA that can give you peace of mind that you can leave the tails of your business in capable hands. With VA you have a dedicated administrative online support on a daily basis. Helping you succeed your goal as the entrepreneur also motivates them unlike a regular office worker. Virtual Assistance is progressing at a rapid speed and if anybody wants any kind of service be it business related or personal you could go for Virtual Clouding. As your blogging or social media business grows, you might find it harder and harder to keep up with tasks such as answering emails, formatting posts, and working with advertisers. By yourself, you’ll have a hard time doings things every single day– there are only so many hours in the day. However, if you are planning to attain things on time and free yourself from so much stress & hassle. Give yourself a break! Seat back! Offshore Staff Pty. Ltd can provide all possible services that you are in need like a potential blogger, you can consider hiring one of our virtual assistant. Think of virtual assistants or VAs as they are often called, as administrative assistants or personal assistants, but they don’t live near you – they do virtual tasks from you always on time. Our Virtual Assistants are highly trained, competent, reliable, fast and well determined to perform any task given. They have been proved to be a rock star in terms of Blogging, Seo, Pay Per Click, Word press, Linking, Social Media, Lead Researching, Posting ads to Craigslist (with or without using PVAS, html creator, Unicodes, or quotes to avoid flagging and being banned on the site) assuring that your ads can be seen by millions of prospect clients for your business. We can also provide Virtual Assistant for bookkeeping services, accounting, inventory, audio-video transcriptions, data entry, appointment setting, email and chat support. Where to outsource my business? This would be the most basic question that will come up once you are planning to have your services or products be facilitated by an outsourcing company. That will play as the front liner of your business to perform such task like; Setting an Appointments, Cold Calling, Answering Services, Order Taking, Bookkeeping, Blogging’s, Responding Emails or Chat Support, Creating Traffics, Referral’s, Lead Researching using such given keyword or niches. 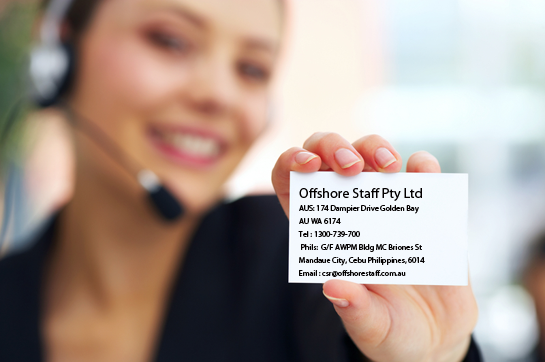 Offshore Staff Pty LTD offers great solution to your business needs. We provide tools, modern science, initiative and staff that will help your business grows rapidly. Our Staff are not good just in numbers but they are more on quality, consistency, and objective, high trainable and very professional in handling such task designated. We are looking forward on helping your business to the best of our knowledge. Were always looking forward in giving out solutions to your business. Offshore Staff Pty Ltd is a medium sized contact center offering a high quality standards of Customer Service, Sales, Lead Generations, Surveys, and Appointment Settings and Any Virtual Related Jobs. We use to maintain a symbiotic relationship to all our clients. So we simply set our perspective of making all things rational for both sides. We want that our clients would be happier by increasing their Return of Investment or (ROI) by providing not just a good numbers but a high rate of sales & service conversions. On our end also, we mainly promote a healthy working environment for both management & staff and encouraged every team member to be more consistent, efficient, tactful, open, and effective. To be more aggressive in learning more, to always have a timely initiative in every circumstance that they may heap into a certain shift, also in attaining a better Key Performance Indicator (KPI). To initiate further trainings and enhancement programs that could make Offshore Staff Pty. Ltd. Not a number center but the most clients preferred contact center. All marketers are storytellers, only the losers are liars. The ideas in this book have elected a president, grown non-profit causes, created billionaires and fueled movements. They’ve also led to great jobs, fun dates and more than a few interactions that mattered. I’ve seen this book in campaign headquarters and carried around at evangelical conferences. I’ve also gotten email from people who have used it in Japan and the UK and yes, Akron, Ohio. The ideas here work, because they are simple tools to understand what human beings do when they encounter you and your organization. That sounds so obvious, but if it is, why is it so ignored? Ignored by marketers, ignored by ordinarily rational consumers and ignored by our leaders. Once we move beyond the simple satisfaction of needs, we move into the complex satisfaction of wants. And wants are hard to measure and difficult to understand. Which makes marketing the fascinating exercise it is. Here’s the second part of the summary: When you are busy telling stories to people who want to hear them, you’ll be tempted to tell stories that just don’t hold up. Lies. Deceptions. This sort of storytelling used to work pretty well. Joe McCarthy became famous while lying about the “Communist threat.” Bottled water companies made billions while lying about the purity of their product compared to tap water in the developed world. The thing is, lying doesn’t pay off any more. That’s because when you fabricate a story that just doesn’t hold up to scrutiny, you get caught. Fast. So, it’s tempting to put up a demagogue for Vice President, but it doesn’t take long for the reality to catch up with the story. It’s tempting to spin a tall tale about a piece of technology or a customer service policy, but once we see it in the wild, we talk about it and you whither away. That’s why I think this book is one of the most important I’ve ever written. It talks about two sides of a universal truth, one that has built every successful brand, organization and candidate, and one that we rarely have the words to describe. Every day, we see mammoth technology brands fail because they failed to ask and answer these questions. We see worthy candidates gain little attention, and flawed ones bite the dust. There are small businesses that are so focused on what they do that they forget to take the time to describe the story of why they do it. And on and on. If what you’re doing matters, really matters, then I hope you’ll take the time to tell a story. A story that resonates and a story that can become true. The irony is that I did a lousy job of telling a story about this book. The original cover seemed to be about lying and seemed to imply that my readers (marketers) were bad people. For people who bothered to read the book, they could see that this wasn’t true, but by the time they opened the cover, it was too late. A story was already told. I had failed. You don’t get a second chance in publishing very often, and I’m thrilled that my publisher let me try a new cover, and triply thrilled that it worked. After all, you’re reading this. So, go tell a story. If it doesn’t resonate, tell a different one. When you find a story that works, live that story, make it true, authentic and subject to scrutiny. All marketers are storytellers, only the losers are liars. The success of the iPhone confused the naming guys at Apple. iPhone means phone + iPod. At launch, the part with obvious value was the phone (we knew that) and the iPod apps were a bonus that ended up being really terrific. Success. And, just as Apple blew it with the word 'book' (Powerbook led to Macbook because they didn't own the word power--IBM made them change it when the processor was changed--which led others using netbook, which they don't own at all), they can't own the word Pad either. Thinkpad is made by Lenovo, not Apple. NEED MORE TIME? ASK ABOUT OUR COST EFFECTIVE VIRTUAL ASSISTANTS NOW! Look around. You're not number one on that bestseller list, or chosen for this RFP or invited to give that talk. It's frustrating. There are engagements you ought to have, sales you ought to be making, clients that ought to understand you... One choice is to spend today frustrated that you're not winning with the product you have for the market you've chosen. The other choice is to focus on what you need to do today to win tomorrow. But part of it is. We spend an enormous amount of time trying to get the world to align with the vision we have for what will make us happy or successful. Whatever "it" is, figuring out how to deal with the noise in your head is probably faster and cheaper than changing the outside world. Not easier, though, merely important. NEED MORE SALES? ASK ABOUT OUR COST EFFECTIVE CALL CENTRE SOLUTIONS NOW! Offshore Staff have Fully Trained and Professional call center agents available for Inbound and Outbound Call Centers. Before becoming an Offshore Staff member, all our call center agents are required to successfully complete a rigorous induction, to ensure all agents demonstrate exemplary professionalism and language skills. Combine this with No Set Up Fees (some conditions do apply), Fixed prices, Great Service and Fast Set up and you can understand why our services will prove invaluable to the growth of your business. Contact us now for an obligation free quote to see how we can help your business prosper.